Upright bikes are very well-known for contributing the most realistic riding experience for users. They are almost designed compact and portable to provide the most comfort for users. They also are simple and basic as well to fit for every size of customer. Here are some products of Stamina you should take a look through. This bike has the Stamina design which gives you the most realistic experience when you are riding. It offers 8 levels of magnetic resistance. They all make no annoying noise and suitable for all people in every level of exercise. Then it not only operates quietly but also was born to help everyone practice to get their shape. And these resistances allow you to challenge yourself with many different levels. To change level, you just only monitor the tension knob to get the most suitable ones quickly. The monitor screen shows you exactly your current time, speed, distance, calories burned, rotation (each minute) and scans. So you can be able to track your time easily to promote your training. Moreover, with the pulse sensors, you can track your heart rate easily. It is synced with the monitor system of your workout, then you can control your rate target conveniently. Besides, the curved handlebars are padded to provide you the most comfortable position during a workout. They give you many different positions to grip so your upper body will be more flexible. The pedals are equipped with straps to protect your feet well, your movements are also smooth, too. Your seat is designed with pad and can be adjusted by a knob. So you can enjoy your seat comfortably and adjust it up or down to get the best position during the whole workout process. In addition, the leveling stabilizer caps help ensure your bike always secure and level during your training. The bike also has compact appearance, and it helps a lot in storing after finishing workout. 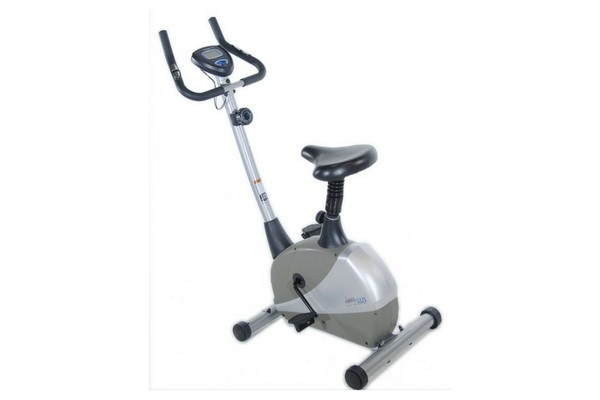 This Stamina 1310 Magnetic Upright Exercise Bike is quite a good choice for your training at home. It offers many efficient features that help you get shape more quickly. This bike offers a smart fitness monitor screen with many training stats displayed. It shows your speed, time, calories or distance to help you track easier. Then you will finish your workout target more effectively. However, this screen is quite small and difficult to see well. Especially, it will shut off after your 4 minutes of training to save the battery. So until it is recovered you can do other things like a kind of relax. Moreover, there is a button on the screen. You can use it to choose your mode or start pedaling or even start the computer to track your stats. This computer is so simple that cannot carry any pre-set. You are equipped with 2 ways of adjusting your resistance. The first one is about the knob on the frame of the bike. You can monitor it to tighten or loosen the belt which is connected to the fan wheel. So your level of resistance will be controlled well. The other can be done when you pedal fast, it makes the air resistance works more efficient. The cushioned seat can be adjusted easily. So you can monitor it more suitable for your height. The handlebars are designed connected to the wheel and pedals to maximize your result of riding. It works when you pedal faster, then your handlebars will move faster and so as the wheel. Besides, the handlebars support your upper body much, too. The pedals are designed with wide size to fit every foot. 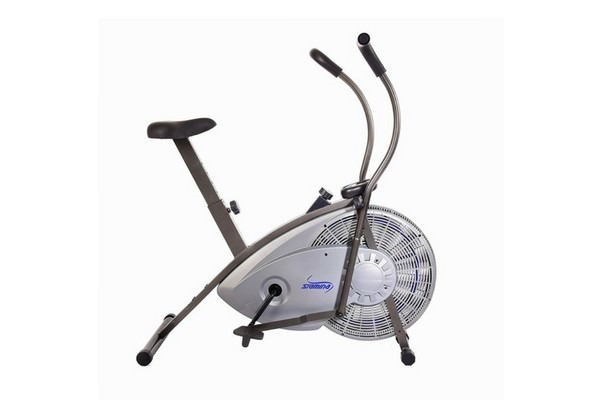 This Stamina ATS Air Resistance Exercise Bike is not a very good one for you to exercise. It allows you to use simply and bored. Moreover, the stats it can show you are very few and there is no heart rate control to promote your workout. This bike has the dual action handlebar which allows you to train your upper body, your shoulder, chest and also your back well. Hence, you not only can improve your lower body but also your upper ones to maximize your training result. The most thing can be mentioned here is even when you choose to ride in a low resistance, your whole body is also worked fully and efficiently. The Fitness monitor can show your time, distance, speed and calories during your riding. So you can track them all and promote your workout well. The screen is big enough to user readout all the stats displayed on. However, the information it provides is not very much though. Moreover, the seat is designed wide and cushion, you can adjust it easily as well. All of them can give you the most comfortable and suitable position for you to get your best result. Besides, all users even the smallest can be satisfied with this seat’s height because it has totally 10 levels of height to choose. In addition, this bike has many air resistances which work very smooth and quiet. That helps users so much on keeping silence atmosphere to not bother anyone. The pedals are designed extra wide and allow any feet to fit in. But they have no toe traps, so your feet cannot be protected well as other bicycles. The bike also has 2 wheels that can be replaced easily. So you can remove it for cleaning stuff quickly and create no harms for your bike. + Full-body workout: with the handlebars design, you can train your upper body as well as your lower ones easily. Then even if you are riding in the low resistance, your whole body will be trained well, too. 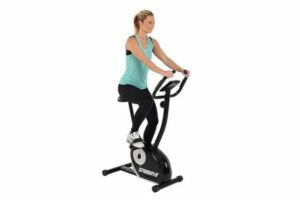 This Stamina Airgometer Upright Exercise Bike is not the best option for an exercise bike for you. It helps you train your whole body at the same time and shows your stats clearly on the LCD screen. However, the construction is not of very good quality enough for a great durability. This bike is considered as a good option for your lower body training. It has the magnetic resistance which works so smooth and quiet. You can control it manually by adjusting the tension dial below the LCD screen. So it seems typically easy to use even for beginners. The LCD screen displays your current information such as distance, speed, time and calories burned. There is only one button here for you to control your mode or reset your riding. It is very basic. Moreover, it is not large enough to see every time when you are in the most intense resistance. The seat is big and has a cushion to provide the most comfortable position for you. You can adjust it with a knob. They offer you many different levels to choose. So every user from the shortest to the tallest can enjoy their seat conveniently. The pedals are not very comfortable as well. They have no straps to keep your feet in the right position during the whole training. So you may slip away your pedals when the workout makes you tired or you are in the high-intensity resistance. Besides, this bike has a really compact appearance and some assembly required, so you can remove it or store it easily and quickly. + LCD display: it shows you some current stats during your workout, so you can track them and adjust yourself to get the best result of the workout. This Stamina 1300 Magnetic Upright Exercise Bike is quite good for any user at home. It allows you to train efficiently and conveniently. Moreover, you will receive the most comfort when using this bike with many good features as well the portable advantage it has. This bike is designed with the magnetic resistance that provides the certain silence while your training. You can adjust it to 8 different levels to get the most suitable workout. There is a tension knob below the LCD screen helping you control that level easier. Moreover, it contains 6 programs for fitness with special pace guide. Then you can follow them to reach your target efficiently and quickly. It is the fact that many Stamina upright exercise bike has no pre-set for users like this one. And it seems to be a big advantage for the bike to attract more customers’ attention. Besides, the handlebars are equipped with the pulse sensors on both sides to help you control your heart rate. Thank that, you may adjust well to reach your fitness aim faster. The LCD can show you much information such as your current speed, distance, time, scan or calories burned. Then you will control it and keep also promote it wisely. The seat is big and padded. It can be adjusted to fit everyone size. However, this seat is not very comfortable for long time training. And the pedals are simple and have no toe straps to protect your own feet while riding. It is such a mistake. In addition, this bike is designed so compact and light that you can remove or store it easily. The warranty for the frame is only 1 year, for parts is 90 days. 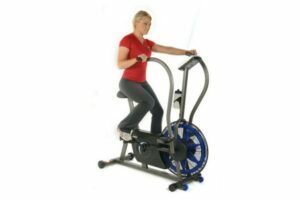 This Stamina 5325 Magnetic Upright Exercise Bike is not a good option for you to training at all. It offers some good features for control your process, but the facilities are not very comfortable for a workout. In conclusion, these Stamina Upright Exercise Bikes are not very good options for your household training. There are some quite good kinds of bike, but some others are not good enough. You need to consider them by following the reviews to choose the best one for yourself.